The objective of a landfill facility is to contain the waste in a manner that is protective to human health and to the environment. Landfills perform by controlling and managing the movement of fluids (i.e. liquids and gasses) around, into and out of the contained waste volume. 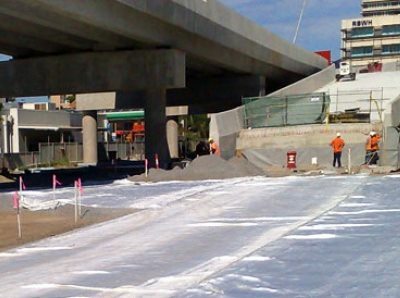 Acting as liquid and gas barriers, geomembranes have become a fundamental component in civil engineering, due to the heightened need for groundwater and environmental protection. High density polyethylene (HDPE) geomembranes, specifically those with a certification by government regulators and thickness' of more than 1.5 mm, are most commonly used. 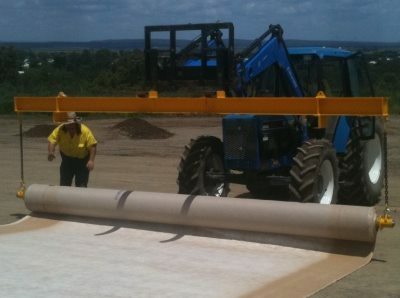 Global Synthetics offer a full range of ProLiner® HDPE geomembranes made to the highest quality using virgin polymer. These can be provided in both a smooth and coated texture. Geomembrane structures, coated materials as well as related construction elements must often be protected from potential mechanical damage. Without suitable protection, damage may occur from sharp-edged objects such as stones, from the unevenness of the subsoil or even by the cover material. Mechanically bonded needle-punched nonwovens as well as composite materials manufactured from polypropylene (PP) are commonly used for protection layers. 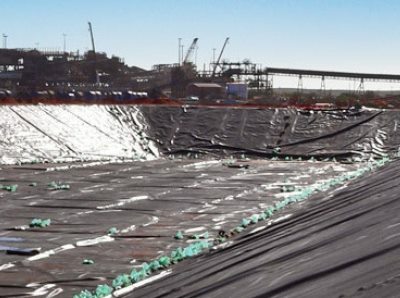 Global Synthetics offer highly protective cushion geotextiles with mass in excess of 3000g/m2 when high levels of protection are required. In many situations, the use of the Naue® geosynthetic clay liner can be used to replace the importation of natural sealing clays at a saving to the landfill owner and to the environment. 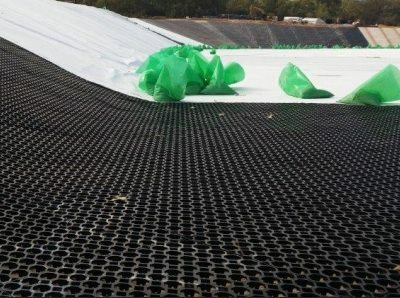 The Naue geosynthetic clay liner can additionally be coated with a polyethylene to give greater levels of safety in containment and reduce desiccation issues, root penetration issues and extend the soil type usage against possible ion exchange issues that may be an issue with conventional geosynthetic clay liners. Drainage materials are required for the surface collection of precipitation, the subsurface collection and diversion of groundwater, as well as the general collection of fluids (including gases) and their discharge into a drainage system (or gas collection system). The use of a Global Synthetics Transnet® geonet or Transnet geocomposite is effective as a drainage system. Complete geosynthetic solutions from Global Synthetics are available to protect the groundwater and environment from the potential contamination of pollutants. The full range of products are durable and ensure a long service life. Compared to conventional construction methods, they are also typically more economical, consume less space, save resources, and reduce installation costs.